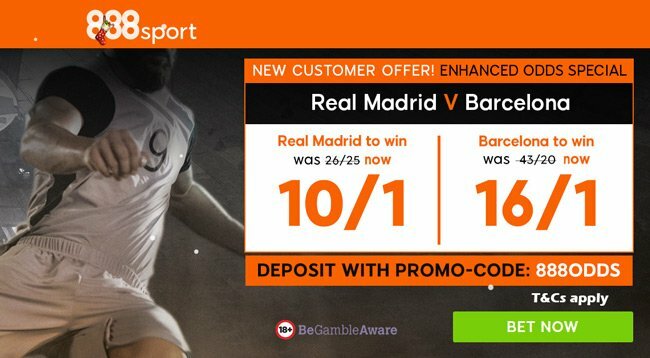 The first El Clasico of the 2017/18 campaign takes place this weekend and 888sport are offering a double price boost on this match! 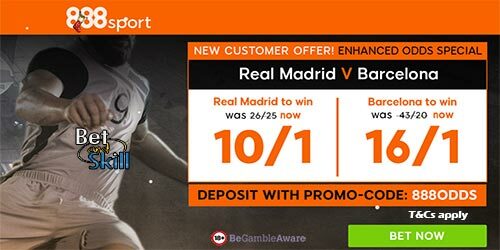 Find here how to claim 10/1 Real Madrid or 16/1 Barcelona to win at 888sport! Max bet £5! Real Madrid return from a successful outing at the FIFA Club World Cup in desperate need of three points having fallen 11 points behind Barcelona in the race for the title and Saturday's La Liga Clasico at the Bernabeu could well decide whether Madrid are out of the title race by Christmas! Who will claim all three points? Choose your price boost at 888sport! "Get 10/1 Real Madrid or 16/1 Barcelona to win at 888sport (El Clasico Enhanced Odds - 23.12.2017)"